If in the previous post we talked about the artistic signs of ownership that can be seen in many houses in the old town of Santiago, today is time for others that can be found in many medieval constructions and of the Modern Age, scattered throughout Galicia. We are talking about the marks of stonemasons, stone witnesses of the passing of time that, in origin, had a rather prosaic meaning. 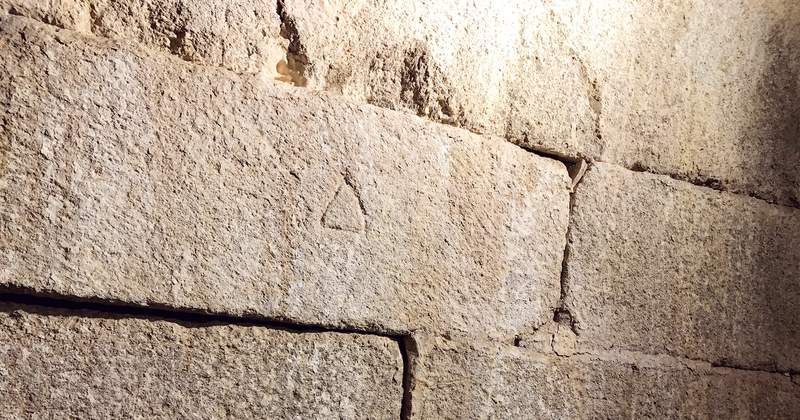 The marks of medieval stonemasons can be seen in buildings throughout Europe, and are strangely similar whether they are seen in old Compostela, in the castle of Monforte de Lemos, in the cathedral of Chartres or in noble buildings in German cities. According to the majority of historians, it was simply a visual way of justifying work and receiving wages. Therefore, many of them are made of a few simple strokes of a chisel, so that, when it came to collecting, it was easy to know which stone mason had made which piece and how many they were to be paid for. However, there are other theories that give them stranger meanings. Isabel Méndez Lojo identifies in a dissertation written for the Museo do Pobo Galego some very simple marks such as arrows, circles, spirals or plain lines, but also abstract drawings, animals or faces. Some of them, says the historian, refer to the quality of the stone, how it was cut or the position in which it should be placed once in at the site. Others refer to the guilds that commissioned the works or the person who paid for the stone and donated it to the construction. There are also, following this same dissertation, other very curious creations. In some stones, the stonecutters recorded game boards in which they possibly killed time between hammer blows. Others could have astrological, religious and even humorous meanings. The work of stonemasons was instrumental for centuries in a place like Galicia in which most of the buildings of certain relevance were built in granite. The stone was taken from outdoor locations by specialists called pedreiros or chanteiros, responsible for supplying raw material. Later, the stonemasons were in charge of shaping the pieces according to what was necessary for the building. The stonemason’s trade was something of a nomadic lifestyle. Highly valued throughout the Peninsula, Galician stone workers travelled from city to city and from town to town, looking for places where they could find work and make a living. Those were usually gruelling journeys, made on foot or, if lucky, in uncomfortable carriages. This hard living made workers group into guilds to support each other and to pass on the knowledge acquired from generation to generation. They did it in a special language that only they understood; that language, the stonemasons’ Latin, was used exclusively by them, and teaching it to people outside the trade could even carry punishment. Another curiosity, beautiful and poetic as we feel is the work of the stonemasons and which is reflected in the work of Isabel Méndez: at the end of the construction, if no misfortune had occurred during the works, the stonemasons placed at the top of the building a bouquet of bay leaves, flowers and oranges; but if there had been accidents, it was instead made with gorse and set on fire.